Frank and Dean Rodney Jr on the very first Big 30 photoshoot. Heart n Soul artist Lizzie Emeh through Frank's camera lens. As you may know, the talented photographer and artist Franklyn Rodgers has been creating portraits of all The Big 30 participants. Franklyn first worked with Heart n Soul 20 years ago, but has also worked with larger organisations, such as Nesta and The National Portrait Gallery. 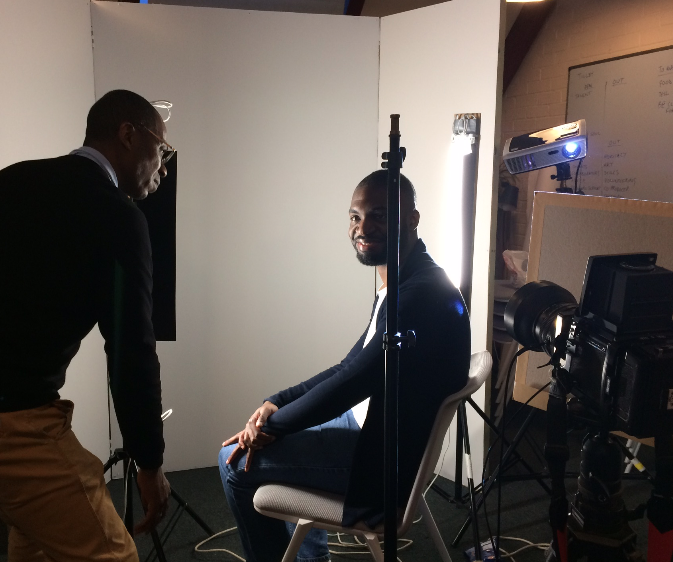 Now that most of Franklyn’s photoshoots have been completed, we took a moment to ask him about his work on The Big 30 project. Heart n Soul: Hi Franklyn! Wow, you’ve now taken almost 30 portraits. Tell us a bit about how you started the whole process? Franklyn: First of all I would like to say what an honour it is to be asked to be part of the project. Starting with the idea, I read and research as much as I can to gain an understanding of what and with whom I am working to explore the idea and process. For the Heart n Soul project, the process began with creating a space where each person or group could communicate how they wanted to be represented through the portrait. I believe that great portraits are given not taken, and creating the right environment to explore that exchange is so important. For The Big 30 project I think I met with around 50 different people. There are 30 portraits, but some of them are small groups. Heart n Soul: What sort of reactions have you had from The Big 30 interviewees? Franklyn: It was the first time that many of the interviewees had been photographed in this way, being asked how they wanted to be seen. Many people found it liberating working with an artist exploring who they are and how they want to be represented. I think being able to take ownership of their identity was very empowering. For example, Dean Rodney Jr, the frontman of the Heart n Soul band The Fish Police, knew he wanted to appear as a Manga superhero character. Heart n Soul artist Tilley Milburn wanted to be photographed on a World War Two RT bus and she confidently made it happen. Heart n Soul: And finally, as you have asked so many of The Big 30 participants what the project means to them for our Video of the Week posts, we thought we would ask you… Franklyn, what does being involved in The Big 30 mean to you? Franklyn: The Big 30 is about people sharing stories, pictures and possibilities. It’s equally about getting people to be open to the idea of difference. The experience of working with Heart n Soul 20 years ago has helped shape how I think about engaging within my practice. It has also been wonderful being part of such an amazing team effort. And so, being able to be part of The Big 30 now is like coming home.